Don’t you love the Us Weekly issues featuring the celebrities, “What’s In My Bag?” series? When I flip to this page, I pour over it! I am always curious as to what products the celebrities are using! I always find myself discovering something new! Maybe I should do a post on the Us Weekly “Best Of What’s In My Bag” in the near future! J/K-kind of! 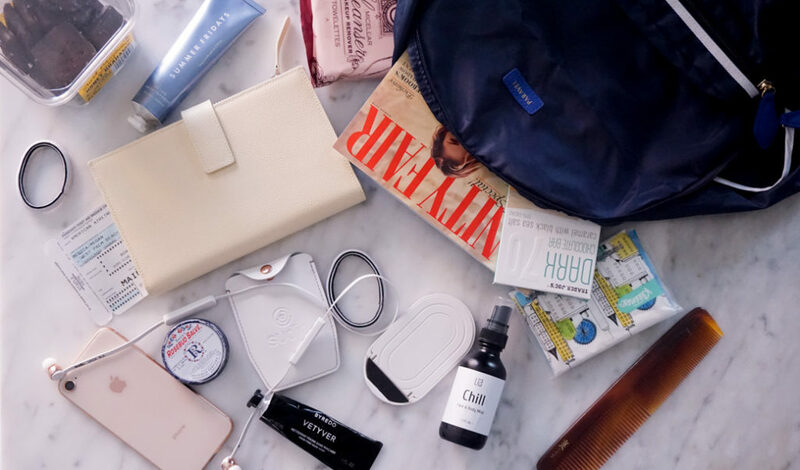 In all seriousness though, in keeping in line with my, “What to Pack Series” on the blog, I thought it would be fun to share what is in my carry on bag when I travel. Between my slight OCD tendencies and somewhat anxiousness when I fly, I really strive to pack a carry on with items that keep me occupied and prepped for a flight. Of course, every well packed bag starts with a great bag! 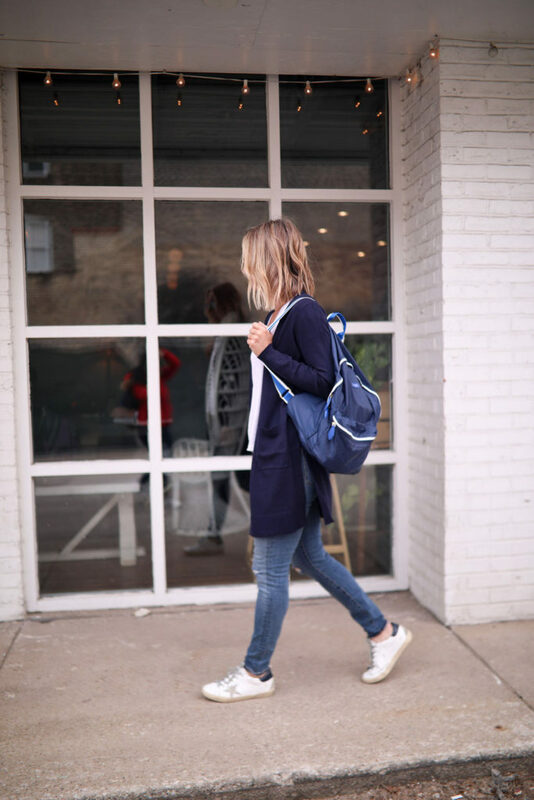 In the past, I have usually relied on a tote as my carry-on, but I recently came across this very “adulting” backpack from Paravel that I had to have! You know I love items that are practical and functional and this bag hits the mark. 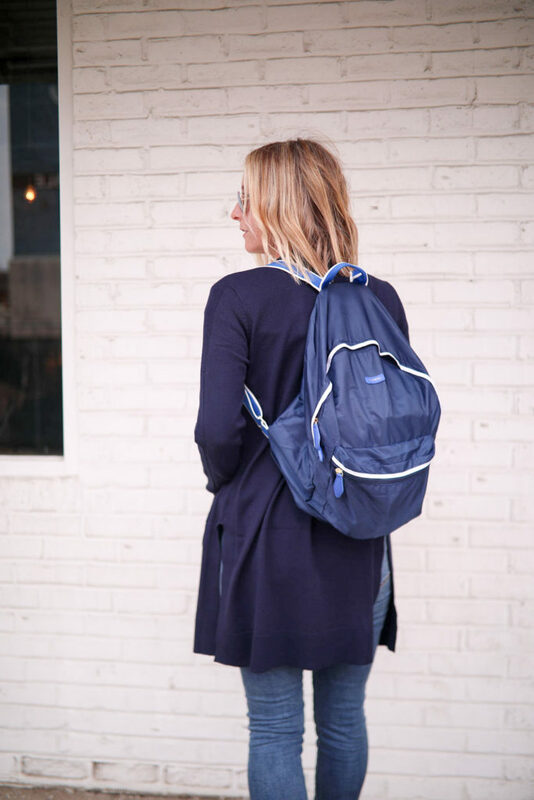 Made out of nylon for easy wipe downs; very roomy for fitting lots of things; and interior and exterior pockets for easy access! Plus it is much more comfortable to carry then a tote! And the best part of this bag? It folds into a very neat, compact pouch making it perfect to add to a suitcase as an extra bag during your travels! Obviously what we pack for a couple hour domestic flight will be different than what we would pack for an overseas flight! Today’s “What’s In My Bag” will focus on the domestic side to travel! Just thinking about loose paper floating at the bottom of my bag turns my anxiety up a notch! I have shared this travel wallet before and I am sharing it again! I love the slim style and structure. It has just the right amount of compartments for keeping travel documents, credit cards and money organized. In other words, it is not over-engineered! We won’t get into a discussion about germs on an airplane but let’s just say a package of wipes is necessary for wiping down your space. I pack another set to freshen my face and hands during travel! I love Micellar wipes and usually pick up a package at Trader Joe’s. It’s the little things that often are the most useful! If you use your phone or tablet to watch or read something when flying, then this flat, compact stand is worth bringing. Instead of holding your phone the whole time, simply place it in one of these! There are so many good options beyond the standard Purell. My mom gave this one to me for Christmas and there is no turning back! The scent is divine and leaves your hands feeling refreshed and clean-not stripped and dry! What can I say? I don’t pack protein bars and fruit. Water, wine and chocolate are the three main food groups I consume during a flight. And of course my chocolate comes from Trader Joe’s. Nothing parches the skin like an airline flight! Queue in this rosebud salve. While I mainly apply it to my lips, what I love about a salve is that it can be used anywhere on the body. It is perfect to apply in those little areas that always seem to be dry-in between fingers and elbows! This is not the first time I have shared this magic in a tube! Specifically designed for travel (but I use it ALL the time! ), this mask does it all. Hydrates, soothes and renews, leaving your skin feeling super refreshed and radiant! It is a travel MUST! Have I mentioned I am an anxious flyer? This essential oil mist does help calm my nerves! It also is great for instant cooling and moisturizing and can be sprayed anywhere on the body! Note: the scent is powerful.